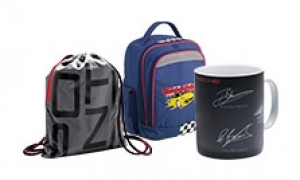 Home Porsche Driver’s Selection Exclusive children's items from Porsche. For young Porsche enthusiasts: gift ideas for children. For young Porsche enthusiasts: gift ideas for children. Porsche Driver's Selection has a wonderful range of gift ideas for the youngest Porsche fans. These presents will be loved by both boys and girls for birthdays, at Christmas and on their first day at kindergarten or at school. The plain and simple designs have been created specially for children. The products are also robust and have been developed with children in mind. With these imaginative children's gift ideas from Porsche, you will surprise and please young car enthusiasts.